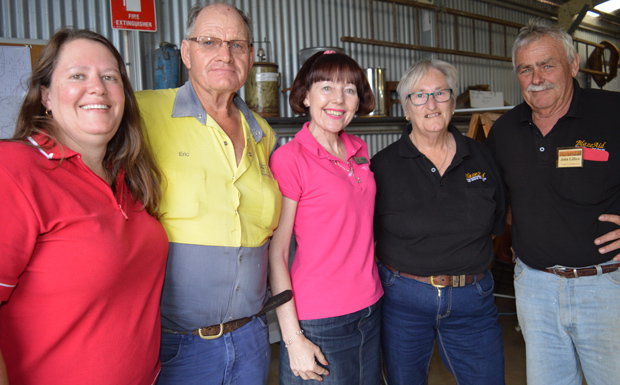 Representatives from a string of South Burnett community groups gathered on Tuesday afternoon to discuss how to support the BlazeAid camp which is being set up in Kingaroy in the wake of last Thursday’s destructive storms. BlazeAid volunteers will be coming from all over Australia to help local farmers clean up and repair fences. They will be based at the Kingaroy & District Machinery Club grounds (Butwell Park) near Kingaroy Airport. Camp co-ordinator is John Lillico, who has travelled from Muttaburra to take charge of the camp. This is the seventh BlazeAid camp that Mr Lillico has co-ordinated across Australia (“everywhere except the Northern Territory”). He has run camps during the cyclones Debbie and Marcia clean-ups as well as bushfires. The groups that gathered at the machinery club grounds included Kingaroy Lions, Nanango Lions, Kingaroy Quota, Kingaroy Rotary, Taabinga Rotary, Kingaroy QCWA and parishioners from the Kingaroy Church of Christ. They were brought together by Kingaroy Men’s Shed president Eric Ford whose group has taken responsibility for co-ordinating the roster for the all-important evening meals provided each night to the BlazeAid volunteers. Deputy Mayor Kathy Duff said BlazeAid had helped out in the region after the 2013 floods and the Boxing Day storms, but on those occasions had been based in Murgon. This was the first time they had set up in Kingaroy. She said the volunteers would be concentrating on farms in the Nanango, Booie and Coolabunia areas which had been hit the hardest by the wind and rain, with a lot of damage to fences. “Coolabunia was just smashed so this is where the bulk of the work will be,” Cr Duff said. However, reports of damage were still coming in from all over the region, from Mondure to Tansey. Cr Duff said The Little Butcher, in Shoppingworld, had offered to donate meat to the camp, and the South Burnett Regional Council would provide $1000 in SupaIGA vouchers to buy groceries. However, the camp could be based in Kingaroy for as long as three months. The first volunteers are expected to start rolling into Kingaroy on Wednesday. Inspections of damaged properties will also start on Wednesday. People who would like to volunteer to work on local properties, support the camp with donations, or register their property for assistance should contact John on 0484-145-732. BlazeAid is also setting up a camp at Lower Wonga Hall to assist farmers affected by the recent bushfires at Woolooga. An admin person is needed for both the Kingaroy and Woolooga base camps for about one or two hours per day. This job cannot be done remotely. Volunteers willing to donate their time – and can use MS Excel, MS Word and complete other administrative tasks – should contact Debbie on 0418-990-172.